Outlander (♦♦♦♦): in Season 1, volume 2, just as Claire is about to return to 1945, she realizes she loves Jamie and stays put. Both flee to Lallybroch, home to the Fraser clan, of which Jamie is laird. As bad luck would have it, Jamie and Jack Randall, the captain of the British troops, cross paths again, and, as always, Jamie will be in the lose end. Season 1, volume 2 feels like a transitional set of episodes that bring volume 1 episodes to their head. In volume 2, Claire realizes that she loves Jamie Fraser and shares the secret of her provenance with him. A chain of events test their commitment to each other and their vows, mostly in the last two episodes, which get overwhelmingly brutal on account of torture. 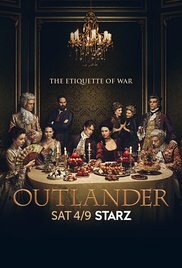 The great acting, the wry humor, the incandescent chemistry between Jamie and Claire, as well as the spectacular Scottish landscape are still signature elements of the series in volume 2 of Season 1, all marvelous reasons to keep watching this series. Captain Fantastic (♦♦♦♦♦): Ben is rearing his six children in the forests of the Pacific Northwest. Despite far from conventional, the kids are outstandingly educated. When news of their mother's tragic suicide reaches them, the kids convince Ben to travel all to attend their mother's funeral in New Mexico. The kids' education doesn't sit well with Ben's father-in-law, who is determined to get custody of the kids. When an unlucky incident puts one of his kids at risk, Ben must consider if living in the wild is the best he can do for them. This Indie gem is achingly funny, acutely smart, a roller coaster of emotions, and overall, a journey of the heart. Frank Langella gives a solid, spirited performance as the kids' grandfather. Viggo Mortensen, in the role of Ben, gives a career defining performance, not a small task for an actor who has spearheaded movies such as A Perfect Murder, A History of Violence, Appaloosa, Eastern Promises, and Hidalgo. If Mortensen is brilliant in his role, so are the six precocious and very peculiar kids, who ably keep up with Mortensen, and who embrace their roles in such a way that one hardly believes they are acting. I had a frolicking time with this romp. Don't miss it as you may be missing a movie filled with whip cracking social commentary. Hell or High Water (♦♦♦♦): Toby Howard owns a farm in Texas that he is about to lose to the bank. There is oil in the land, but he is in such a financial hole that he even owes money to his ex-wife in child support for their two children. Toby refuses to hand in the farm, so he conceives a plan—aided by his ex-convict older brother Tanner, to rob small branches of the bank that owns his reverse mortgage—to gather enough money to pay off the mortgage, the back taxes, and put the land in a trust so his kids, because he is putting it in his kids' names, never again worry about money. They only have to keep it small, don't shoot anyone, and outsmart two law enforcement officers hot on their trail. Hell or High Water is a testosterone charged, fast paced Western with a modern twist. The horses have been exchanged by old wheels, but the bank robberies, the shootouts, the die-hard law enforcers, strong females in need, decaying towns, and the big guns are present in full force...The action unfolds in Texas, after all! The social commentary referring to predatory banking practices and poverty cannot be ignored. Brilliantly acted, Chris Pine, Ben Foster, and Jeff Bridges give career changing performances. I wasn't fond of Jeff Bridges' (as the old Sheriff) Texan accent; I thought he sounded like drunken lawman "Rooster" Cogburn in the Coen brothers' adaptation of True Grit (2010), a character also interpreted by Bridges. I wasn't too fond of the Indian bashing either; it was a little too much. Aside from those two things, no detail was left to chance, either with the flawless screenplay, the acting, and production-wise. 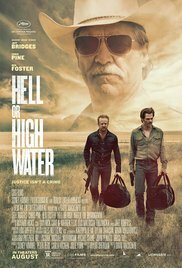 Hell or High Water is, by far, one of the most impressive movies I have seen this year before the onslaught of awards' season's contenders. I do not watch TV, so I'm totally unaware of the television series. (Not in a negative way... it's not my thing, but on the other hand I love movies). I definitely want to see Captain Fantastic. I'm fond of Mortensen and Langella. I also want to see Hell or High Water (adore Jeff Bridges.). Thanks for this brilliant review. Thanks! I had a strong TV phase in the mid 90s to 2000. From then on, I followed this show or that until something in the story line or a change of characters would turned me off and I would stop watching those shows even if they weren't done. I swore TV off for a few years until last December when I started watching a few shows that have been making buzz. You are in for a treat with these two movies. 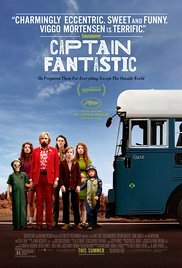 Captain Fantastic surely sounds like something I would love to see. Viggo Mortensen and Frank Langella are a great recommendation for any movie. They are both brilliant in it. Thanks Carmen. Two more for the queue for me! Movies that is. We saw and liked both Captain Fantastic and Hell or High Water. Viggo Mortensen and Chris Pine were both good in these. I agree, they're not to be missed. Captain Fantastic came into my radar after reading your thoughts on it, so thanks a million for that one! Both movies were among the best of this year, in my opinion.